Do you schedule your own meetings and appointments? Depending on how often you do this, manually scheduling can be a huge hassle. Wouldn’t it be nice if there was a way to have all of this taken care of for you? Something to consider is adding some type of online scheduling to your website. Frequency of Booking. What is the common duration of time that will be scheduled? Is it by hour, day, week, etc.? Some programs you pick have pricing determined by number of events/appointments so even having a range is helpful. What are people scheduling? A common example is time (appointments, meetings, etc), but it could also be something physical (rooms, seats, a car, etc). Some programs are built for theaters, allowing people booking to pick specific seats or allowing the venue to set different prices for different seating areas. Thinking about what information you need to collect might help you pick between options. Does it need payment processing? Some businesses prefer to take payment at the time of booking, while others prefer to use the scheduling simply to make the reservation but accept payment at the time of service/pickup. Note: if you already have an online processor and want to use it for your online booking, make sure the payment processor and your software are compatible. Do others need to be able to collaborate? If you have a team of multiple people scheduling things, or if they need to share their own availability, it may be helpful to have them able to access the scheduling system on their own. Some software charges by number of users so this is also helpful to know. How much control do you want over it? Do you mind if all bookings are automatically approved, or do you want to manually approve because only certain people can book 1-2 p.m. on Thursdays and interrupt your yoga class? Remember in general manual equals more work but also more control. What do you need to integrate? 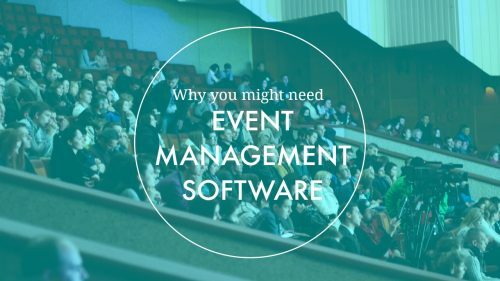 If you already are using a POS system or run a Shopify website, you may want your new event management software to integrate with it. Thinking about what you are already using might help narrow the field. How much are you willing to pay? Depending on the features and control you would like to have, you may need to throw down some extra money. If you just need something simple, you’re more likely to find it for free. As far as software goes, some charge you a flat fee, some for a number of events/users, and some based on the features (for example one price based on basic ticketing and a second higher priced for a package of software with flashier features). What online scheduling options do we know about? Join us for the next blog post where we’ll talk about the ones we’ve worked with and what we like/don’t like about each. In the meantime, what could you be booking/scheduling online that could free up your time? Note: This might be our last broadcast from our current office. Next week, we may have a different wall behind us! Most businesses have some sort of scheduling aspect (we tried to think of examples of businesses that don’t need scheduling, and it was surprisingly difficult). 1) How often does the event occur? Is it a regularly occurring event (i.e. once a week) or One and Done (i.e. a conference)? 2) Do want people to pay online or hold payment (a la hotel)? 3) Is this for internal use (scheduling employees) or customer use (i.e. booking a room/provider)? 4) What is it you’re scheduling? A place (room, seat, etc), person (doctor, hair dresser), or a time slot? And, finally, remember to test out your scheduling software before launching it to the public, or whoever is going to be using it. You want to make people feel smart and make sure they understand what they’re booking, after all! While most booking software costs money, think about a) how much time you’ll save by having a program handle this aspect of your business for you and b) utilizing the free trial period (a good 95% of these programs offer a 1 month free trial period, so you can really determine if it’s the best fit for your business needs). If you have any topic requests for us, send us an email, comment on the video, or visit our website at www.breakingeveninc.com!